Please specifiy a size for each cutting, the minimum cutting width and height is 150 mm, the maximum width and height depends on the plate dimensions. Inputs which are red colored are invalid. We offer a free cutting of the panels according to your idea. The purchase occurs only for whole cuttings or in the formats specified above. Please note that the cutting width is 3-4 mm and the minimum cutting width and height is 150 mm. 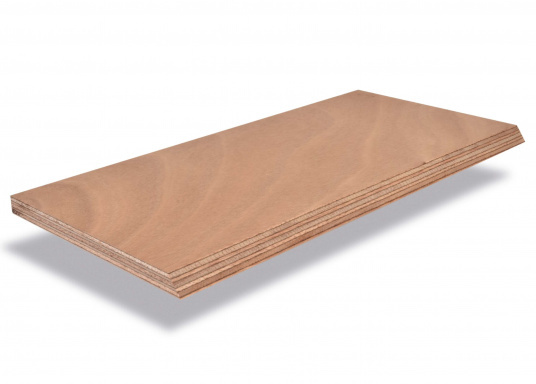 High quality plywood sheet for the constructive refinishing of the interior, ideal for example for flooring, chests, walls, berth beds or similar. The sheets are AW 100 glued and is made out of Okumé. Outer layer 1mm veneer. Sheet dimensions: 250 x 122 cm. Wood is a natural product - therefore slight variations in color or structure can occur.